O. ingens reaches a length of at least 500 mm ML (Kubodera, et al., 1998) and is found in circumpolar but mostly sub-Antarctic waters. with rhomboidal fins (ie fins not drawn-out posteriorly). with warts on the skin. with rostrum of gladius having a triangular cross-section. Club with usually 14 pairs of hooks (range - 13-16 hooks, dorsal series, 13-15, ventral series). Figure. Oral view of tentacular club of O. ingens. Drawing from Pfeffer, 1912. Ventral mantle with soft, irregular warts. Figure. A piece of ventral mantle skin of O. ingens. Drawing from Pfeffer, 1912. Maximum width of vanes ca. 11% of gladius length (to tip of conus). Rostrum 11-12% of the ML, triangular in cross-section. Figure. Ventral view of gladius of O. ingens with cross-sections. Drawing from Pfeffer, 1912. This description is taken from Pfeffer (1912). Additional features of the description can be found here. The tentacular club of a young O. ingens, 77mm ML has a few marginal suckers still remaining on the proximal dorsal margin and on the distal ventral margin. Figure. Oral view of tentacular club of O. ingens, 77 mm ML. Drawing from Tsuchiya and Okutani, 1981, p. 145, Fig. 35. Dubinina (1980) described a juvenile squid from the Southwest Atlantic as Onykia robsoni (drawing to the right) but according to C. Nigmatullin (personal communication) it probably is a young O. ingens. The scale bar is 1 mm. Figure. Ventral and dorsal views, probably, of O. ingens, 13 mm ML. Drawing from Dubinina (1980). This species is circumpolar in sub-Antarctic waters. A map of its distribution is found here. Clarke, M. R. 1980. Cephalopoda in the diet of sperm whales of the Southern Hemisphere and their bearing on sperm whale biology. Discovery Reports, 37: 1-324. Dubinina, T. S. 1980. On a finding of a larvae Moroteuthis robsoni (Oegopsida, Onychoteuthidae) in South-west Atlantic. Pfeffer, G. 1912. Die Cephalopoden der Plankton-Expedition. Zugleich eine Monographische Übersicht der Oegopsiden Cephalopoden. 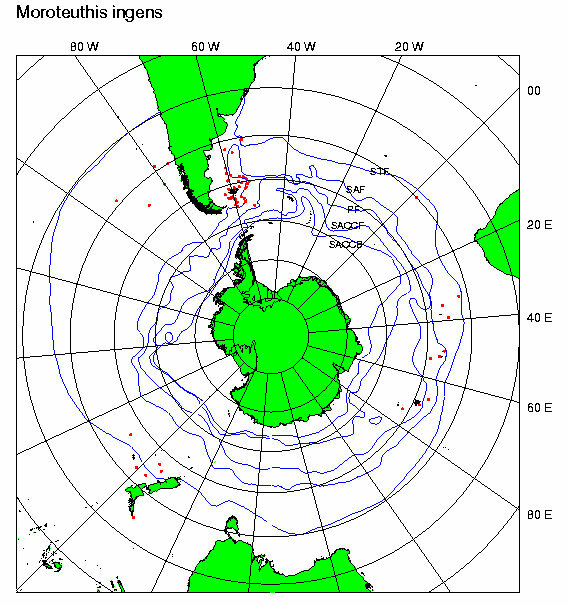 Ergebniss der Plankton- Expedition der Humboldt-Stiftung, 2:1-815. Page: Tree of Life Onykia (Moroteuthopsis) ingens (Smith, 1881). Authored by Michael Vecchione, Richard E. Young, and Kotaro Tsuchiya. The TEXT of this page is licensed under the Creative Commons Attribution-NonCommercial License - Version 3.0. Note that images and other media featured on this page are each governed by their own license, and they may or may not be available for reuse. Click on an image or a media link to access the media data window, which provides the relevant licensing information. For the general terms and conditions of ToL material reuse and redistribution, please see the Tree of Life Copyright Policies.